Nana Kojo Bamba, the Ashanti Regional organizer of pro-NPP vigilante group, Delta Force has revealed that executives of the ruling New Patriotic Party never promised them jobs in the lead up to the 2016 elections. Members of the group had claimed that the party has failed to honour its numerous promises made to them, particularly on the issue of employment which made them fight to bring it into power. The issue of job promises has come up in the wake of an attack on the minister for Monitoring and Evaluation Dr Anthony Akoto Osei who had to run for dear life when some members of the Vigilante Group stormed a meeting he had organized at his constituency on Sunday. “The MP was lucky he escaped but we gave some of the executives’ dirty slaps for not fulfilling their promise to us. We give monies to our boys to buy police forms but they are always left out. This is not what they promised us,” Hak-Musah Tasure a member of the group told Accra – based Adom Fm. 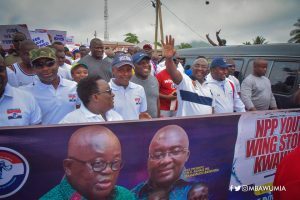 However speaking on Kasapa Fm Thursday, Nana Kojo Bamba rejected the claims saying “Nobody promised anyone anything, we ourselves are executives of the party, some of us are party polling station executives and constituency executives. So to say we were promised something that is why you attacked the minster is actually wrong”. He says their motivation to work for the victory of the party stems from how the resources of the country was badly mismanaged by the erstwhile National Democratic Congress (NDC) led by former president John Mahama. Meanwhile, two members of the group have been arrested and remanded into police custody by a circuit court for attacking the minister. The two, Paul Atta Onyinah, 49, and Richard Yaw Brefo, 51, were picked up at Tafo Pankrono in the Ashanti Region and charged with conspiracy to commit crime and rioting.